Hamdeen Sabbahi, founder of the Egyptian Popular Current, stated at a Monday press conference that opposition protests would continue until President Mohamed Morsi's recently issued decree – which has caused a political firestorm in Egypt – was annulled. On Thursday, Morsi issued a decree temporarily making all his decisions immune from legal challenges. The decree also protects the Islamist-led Constituent Assembly, tasked with drafting a new constitution, and the Shura Council (the upper house of parliament) from dissolution by court order. Morsi's surprise declaration was met with uproar by Egypt's opposition forces, who described it as an "attack on democracy" and a "threat to judicial independence." Tens of thousands demonstrated against the move on Friday in Cairo and other Egyptian governorates. Sabbahi asserted that the annulment of the decree represented the main demand of the National Front, which is "fighting the fire of dictatorship." The National Front was established on Saturday by several prominent political figures in an attempt to counter the Morsi's divisive decree. Monday's press conference was attended by various political figures, including the liberal Wafd Party's Sayed El-Badawi, who sarcastically thanked Morsi for issuing the decree, which, he said, "has united the National Front for the first time since the January 25 Revolution." El-Badawi added that the front would not negotiate with Morsi until the controversial decree was overturned. 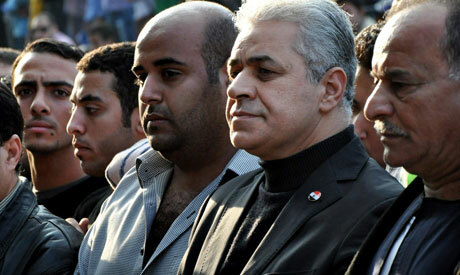 Mohamed Abul-Ghar, for his part, head of the Egyptian Democratic Party, described the current situation as "disastrous." "But Egyptians have changed [since last year's popular uprising], and they will bring down the president's decree," Abul-Ghar said. We did not hear your voice or see your millions upon the declaration in June by general Tantawi and you were happy and silent because Tantawi would share the power with president that you do not like .You real faces are very clear. Don't listen to Leftist.They are adopted thuggery way to unstable the government.This way had been applied to topple many government in past time.When they got power they militarized the country. The liberal just adopt western values and try to frightening people about Islam.Why Muslim should fear about some Islamic laws. Finally the preconditions exist for a genuinely negotiated solution, namely rough equality of forces. The opposition should demand general negotiations with the government regarding the constitutional package. The president need not withdraw anything, but only establish a new institutional setting: A National Round table.